SplashPhoto for Palm OS allows PDA users to view and display images on-the-go. The software is supplied as two main components: the PalmOS application and a desktop PC catalog and syunchronization conduit with which you can crop or edit those images, add or delete images from the different SplashPhoto catalogs you create and then load them onto your handheld device. Adding an photo to your catalog is as simple as drag & drop (for users of iPhoto) or selecting photos stored on your hard drive. You can choose JPG, GIF and BMP image files, but SplashPhoto will convert them all to JPG. SplashPhoto also provides some basic editing functions. Renaming photos something other than DSC0000123 is always a good start, but through the SplashPhoto Edit Dialog you can crop, adjust brightness and contrast, rotate and choose whether you want your file uploaded in your PDA’s native screen dimensions or the dimensions of the original file. I recommend you stick with your screen’s native resolution because large files take up more space on your handheld than is necessary. Another nice thing about using the smaller size is that in the Edit Dialog you can zoom in on your photo and scroll around to get the perfect crop. Once you've organized your photos, the only thing left to do is to sync. Be forewarned that all the photos in your catalog will be uploaded to the PDA along with their assigned categories, so don’t go loading all 300 shots you took at the beach this summer into your SplashPhoto Catalog, expecting only the ones selected in the “Sunset” category to make it to your handheld. Nope. The catalog is really the desktop representation of what files are going up to the handheld and what they will look like. If you don’t want a picture on your handheld anymore, you can delete it directly from the device, but unless you also delete it fromthe desktop catalog, you are going to upload it again at your next HotSync. 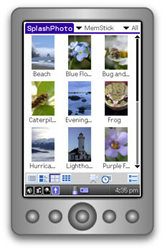 You can view the different photo categories on your PDA in a similar manner to that of the SplashPhoto Desktop. List View will give you the file name, it’s assigned category and file size, etc., while Detail View gives you the same information with a little thumbnail of the photo. Thumbnail View will display large thumbnails and Gallery View displays small ones. You can view your different categories via a dropdown menu on the top right corner of the display. Tap the picture you want to see and it will load. If you chose to keep your picture in its native resolution you will also have some simple zoom features at your disposal via the Options menu. Now what would an image viewer be if it didn’t offer a slideshow function? Well not much of one, so I’m happy to report that SplashPhoto does a fine job at slideshows. A little icon at the bottom of the SplashPhoto screen allows you to start the slideshow and another icon provides configuration options for the duration each picture is on screen and whether or not your shots show up in chronological or random order. You can also configure the slideshow to start whenever you put your device in its charger. This is probably my favorite feature as it really brightens up an otherwise dull office desk. Cons: Image loading is a bit slower than the competition, apparently resulting from very little prefetching or caching of stored image data or headers. Be careful of your image dimensions - SplashPhoto does better with sizes closer to native PDA resolutions. Limited zoom functionality. Non-intuitive desktop catalog functionality. Pros: Smooth operation, intuitive controls in the Palm program, excellent image quality. Store photos in device memory or expansion card. We looked at SplashPhoto on a Sony Clie PEG-N760C and a Palm Zire 71. We discovered that the Zire 71's built-in camera functioned automatically with SplashPhoto - very nice. The Clie display looked quite good running SplashPhoto, but the superb Zire screen really allows SplashPhoto to shine. Nifty product featuring excellent integration with PDA camera hardware. Recommended.